There's something important that chronically indecisive people need to understand: They're not actually interested in making a decision. Since this statement flies brazenly in the face of common sense, let me restate it differently. Indeed, as these individuals anguish intensely over the pros and cons of a given option, they think they want to be decisive. But they're fooling themselves. Behind their apparent sincerity, they're cozying up to an old unresolved negative emotion (inner passivity) which involves feeling weak, helpless, and lacking in the sense of their own authority. This old joke satirizes the emotional predicament: " Once I make up my mind, I'm full of indecision. " Through this emotional weakness, indecisiveness haunts a significant percentage of people. When we finally do make up our mind--after agonizing and procrastinating long enough--we're likely to start being indecisive over some other matter. The misery and self-defeating consequences of our indecisiveness are the prices we pay to cover up an inner conflict. What is that conflict? On the surface of our awareness, we do indeed want to be decisive. We want to feel the pleasure and sense of authority that goes with making a good decision on our behalf. Deeper down, it's a whole different matter. We don't want to feel decisive. It's too tempting instead to "know ourself" through unresolved inner weakness. We want to experience ourselves through the old self-doubt, uncertainty, and sense of unfitness that is an emotional default position. At a deep level, we've known ourselves through that familiar frailty as far back as we can remember. People can shift away from that old identity, and experience the pleasure of wisdom, discernment, and decisiveness. The quickest way is to expose our inner passivity and begin to understand how it gets entangled with inner aggression (inner critic or superego). Let's try to bring this into focus. 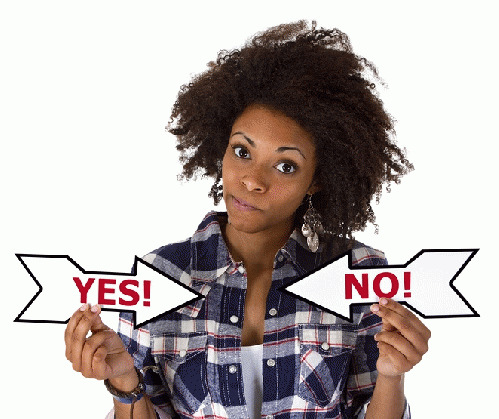 When compulsively indecisive people do finally make up their mind, what often happens? They start to worry that they have made the wrong decision. They start undermining themselves and second-guessing their own authority. Why does this happen? Their sense of authority comes under attack from their inner critic. They feel they will be harshly condemned from within if their decision turns out to be a bad or costly one. Their sense of authority collapses because, in the face of the self-aggression that emanates from the inner critic, they have retreated into inner passivity. Tenth-century philosopher Maimonides said, " The risk of a wrong decision is preferable to the terror of indecision." Often, thanks to our inner passivity and inner critic, it's the other way around: "The terror of indecision is preferable to the risk of a wrong decision." The inner critic, in any case, can get us either way, in the first instance for being passive, in the second instance for daring to express inner authority that circumvents the inner critic's assumed preeminent authority. Indecisiveness is one of the many painful symptoms that arise because of the major conflict in our psyche between aggression and passivity. The conflict puts us, as mentioned, in a no-win situation: If we hold off indefinitely on making a decision, our passivity, along with accusations from the inner critic of our shortcomings, cause us to feel terrible; if we make a decision, we fearfully and passively experience self-doubt in conjunction with the sense of being held accountable by our inner critic for possibly having made a bad choice. Similar dynamics are involved with procrastination: We feel terrible when we procrastinate, yet our inner passivity keeps us trapped in that behavioral predicament. With indecisiveness (and many other emotional difficulties), there are two dimensions of the problem: one is the reality dimension, the other the unconscious dimension. We can look at an example to see how these two dimensions become entangled. Consider the case of Roger, a neuroscientist who is plagued with indecisiveness about whether to leave his wife for another woman. He has been debating the question with himself for more than three years. All Roger considers, though, is the outward reality dimension, the pros and cons in his mind of leaving his wife. What he doesn't see--from the unconscious dimension--is that he's acting out his version of an inner conflict that troubled his father who for many years had complained of feeling trapped on a dead-end career path. So Roger is clinging to an unsatisfactory situation (the reality dimension) and failing to trace his predicament to the identification he made during childhood with his father's conflict (the unconscious dimension). Roger is determined to go on experiencing himself in a passive way because doing so is such a major ingredient in his sense of self. This determination constitutes a stubborn resistance to inner growth. In a way that is both literal and figurative, he also has an emotional addiction to the feeling of being passive. Indecisiveness can also serve as a defense against realization of one's determination to be passive. It constitutes, in its stubbornness and in the mental effort of weighing pros and cons, a smattering of strength that provides the individual with the illusion that he is acting--albeit very slowly--in his best interests. "I'm not being passive," the unconscious defense reads, "I'm trying very hard to make up my mind. Look at the effort I'm making. It's just taking me some time." This tact inspires the wisecrack, "If I decide to be indecisive, that's my decision." Indecisiveness crosses over into procrastination and also ambivalence. Ambivalence is the experience of two contradictory feelings toward the same person or situation at the same time. Again, ambivalent people can't decide how they really feel. They may like a particular person, but through their own unresolved issues they get triggered by the words, behaviors, or personality quirks of that other person. Often when an indecisive person finally makes a decision, she might feel she was compelled or brow-beaten to do so by the insistence of others. Again, inner passivity is the problem. Even if caring friends pushed her into making a good decision, she can be resentful due to her unconscious determination to feel forced, controlled, or dominated. Keep in mind that inner passivity, which constitutes unresolved negativity in our psyche, always goes looking for opportunities to be experienced. In my articles at this website and in my books, I have described hundreds of the self-defeating ways in which it is experienced. Inner passivity, which inhibits us from identifying with our inner authority, can be understood as a hindrance to freedom. If you look online for guidance or understanding about indecisiveness, you're likely to find only advice, not insight. This article at Forbes magazine, written by a psychiatrist, offers seven ways to conquer indecisiveness, including trust your gut, channel Winston Churchill, and flip a coin. Advice like this is cheap if not worthless; in contrast, insight is precious. We're simply not going to become wiser and more intelligent when we fail to see the deeper dimensions of our struggles with a behavioral and emotional problem such as indecisiveness.